To arms! To arms! The battle lines are drawn as desert men and inhuman tribes wait poised to strike on the fertile and rich lands of the east. The call has gone out through all the civilised lands. The armies have been raised to match the invading foes from the west. Nobles and peasants have joined swords to greet the foes. But Fate or Chance has decreed another role for a small few. No glorious banners will wave on thier march. No squadrons of knights will chrge at thier word. Instead, they will fight the war with stealth, secrecy and cunning. The risks they take are great, but the fate of both armies lie with them. It begins one night for your party far away from the fighting. Suddenly you are entrusted with the most dangerous mission of the war. Can you cross the Sind Desert, occupied now by the enemy armies, to find the Great Pass? So begins your adventure in The Master of the Desert Nomads, the first module of a two-part adventure that can be concluded in the exciting Temple of Death or played entirely on its own. Can your party do what must be done? Sent on a desperate mission into an unknown land, you must seek out the one called "the Master" and his Temple of Death. There is little time to waste, as you must act before the Master's armies destroy your homelands. But to complete your task you must battle fearsome guardians, travel through a hostile kingdom and discover the secret of the Master. Can you survive his defenses and win? This module contain's referee's notes, background, maps and detailed keys. 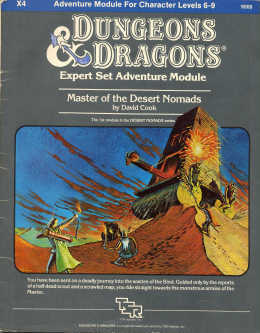 It is the second adventure in the two-part Desert Nomads series begun in X4, Master of the Desert Nomads, but it can stand on its own as a separate adventure. Whether you play Temple of Death by itself or as part of a series, the adventure will offer you hours of excitement and fun! The nomadic tribes of the Great Wasteland have banded together and are preparing to wage war on the Empire. A call to arms has been given and the PC's have offered their services. The adventure starts with the PC's joining up with the army reserves the main body of the Army having already departed. One night the PC's come upon a man, (Guilliame), being attacked just outside the camp by an evil force. The man turns out to be a spy of sorts for the forces of good and the PC's are soon asked to put their skills to a special mission. The person behind the nomadic tribes, "The Master", is the ruler of Hule, a land beyond the mountains that lie on the northern border of the Great Wasteland. Guilliame has a map showing a passage through the mountains to Hule and charges the PC's travel there and deal with the source of the evil. X4 takes the players across the desert to the Evil Abbey that guards the passage to Hule. X5 takes the players into the Land of Hule and to the Temple of Death where the God-King known only as "The Master" is waiting for them. Master of the Desert Nomads has it all in an adventure that takes place over a wide area and throwing many different challenges at the PC's as they pass from their settled homelands through the Sind Desert to the the Great Pass. The DM is given a list of encounters for each of two general areas that the PC's are travelling through, the Asanda river and then the Sind Desert. Although there is some guidance over where these should appear in the journey the DM has a fair amount of latitude when to place them and this works really well. The encounters are well thought out and I especially liked one where a caravan the PC's are travelling with is ambushed. The designers have given a round by round flowchart of the action as it would go if the PC's were not there and so the DM can easily ascertain the impact of where the PC's stand and how they fight. That said there are no where near enough encounters to fill the journey so you can either use random encounter tables, (which I loathe), leave a pile of open boring days or come up with your own stuff. The adventure ends at a monestary that guards the Great Pass to the land of Hule and here returns to a dungeon style bash, albiet with a bit of a twist. 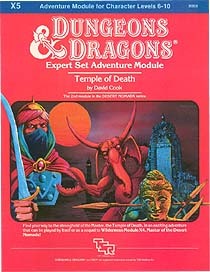 Temple of Death starts at the Great Pass, a maze like series of paths through the mountains with set encounters by location. The PC's exit to the land of Hule where they must keep thier wits about them lest they reveal thier intentions to the population who are fanatically loyal to the Master. Finally and centrally to the module, the PC's enter the Temple of Death and confront the Master. The Temple is well put together and there is a beautifully drawn picture of the Temple from the side and in plan view which help bring some of its unique design features to life. Overall these two adventures are a great mini campaign. You may have to shoe horn it into an existing world, but it is well worth it. Best Action Remembered : A classic. One of the party, a chaotic neutral magic-user/thief called Debenhams, had a Wand of Wonder. Not the best combination for anyone who needs a well thought out plan of attack. During the final fight, The Master is standing a level above the PC's and firing spells at them through a large trap door. Debenhams points the wand of wonder and a Rhinoceros appears in mid-air in the trap door space. The huge beast promptly plummets to the ground crushing a another PC, a dwarvern fighter called "Guinness"!. After the combat she decided to zap him a few more times to see if she could bring him back to life but that stopped when he disappeared, (was actually teleported to the Etherial plane but the party convinced her that she had disintegrated the body). Good Points : Epic adventure taking place over a large area. Good new monsters. Encounters are well explained. a good storyline which has certain interesting subtleties. Bad Points : Too many unoriginal names like "The Master" and "The Great Pass" etc. If I were to run it again I would change all those names. These two adventures are from the X series for the D&D Expert set, (the one after the Basic set in the blue? box). There were I think 5 in the series of which X1 Isle of Dead was also good and X2 Chateau d' Amberville is reviewed on this site. X5 Curse of Xanathon was the weakest of the set but still passable. The X series was continued to X13 and in that X10 gave us Red Arrow Black Shield. This was part wargame and part advendure that continued the story in X4.